I look forward to seeing miracles every day. Dr. Amanda Zimmermann has been in practice since 2015. 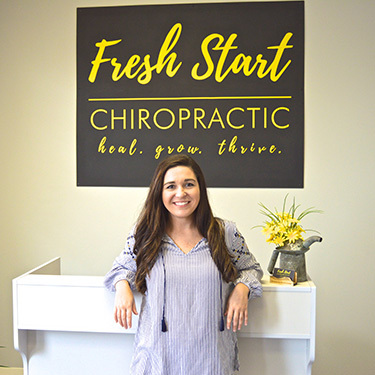 Since graduating from Parker University in Dallas, Texas with a Doctor of Chiropractic, she worked as an associate doctor before returning to her hometown, founding Fresh Start Chiropractic. As you can tell from our name, we want to give you a new beginning so that you can heal, grow and thrive. With a focus on families, Dr. Amanda especially enjoys seeing expecting mothers as well as children. We welcome everyone from Avon, the surrounding communities and the entirety of northeast Ohio to experience optimum wellness through natural chiropractic care. Dr. Amanda cares for patients of all ages who are seeking help with a variety of different concerns. One such case involved a pregnant mom who was 38 weeks along, nearly set to bring her baby into the world after having a stressful pregnancy experience. The baby, however, wasn’t so ready and was lying in a breech position. Within two weeks, the baby turned into the proper position with the head down, and the mom had the birth of her dreams. Another young patient was a 7-year-old girl who had cerebral palsy and was unable to walk. Within a month of care, she was walking again. If you’re ready to discover what chiropractic care can do for you and your loved ones, contact our Avon chiropractic care center today! Complimentary consultations are available.